Important New Rules for Federal Employees Created by the National Defense Authorization Act for Fiscal Year 2017 | Kalijarvi, Chuzi, Newman & Fitch, P.C. Each fiscal year, for the past 50 years, Congress has passed a National Defense Authorization Act (“NDAA”). Primarily a budgeting and expenditures authority for the U.S. Department of Defense, the Act also often serves as a vehicle for numerous other provisions that have wide-ranging impact on all aspects of the federal government. 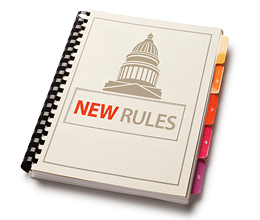 The following is a concise list of changes in Title XI of the 2017 NDAA, which contains new provisions that concern federal employees. 1. The two-year limitation on noncompetitive appointments for military spouses is eliminated. This means that a relocating spouse can now serve in a noncompetitive appointment until the end of his or her spouse’s service. 2. Select employees—those serving under a time-limited appointment in the competitive service for a domestic defense industrial base facility or the Major Range and Test Facilities Base—are now eligible to compete for permanent positions in specialized circumstances. Additionally, benefits for such employees will be comparable to those employees who are not serving under time-limited appointments in the same facilities. 3. There is a one-year extension for: 1) (from 2017 to 2018) the authority to grant allowances, benefits, and gratuities to civilian employees in combat zones; and 2) (from 2016 to 2017) the authority to waive the annual limitation on premium pay and the aggregate limitation on pay for overseas civilian employees. 4. An advance of basic pay for up to four pay periods is permitted for employees relocated to an agency position outside of their commuting area. 5. Time-limited appointed employees may now compete for permanent appointments at any federal agency. 6. Official personnel files of former federal employees must be reviewed when they are being considered for rehire into the competitive or excepted service. Specifically, the appointing authority is now required to review and consider merit-based information relating to such employee’s former period(s) of service, e.g., official personnel actions, employee performance ratings, and disciplinary actions, if any, prior to making a determination with respect to the appointment or reinstatement of such employee. a. Administrative leave is now capped at 10 workdays per calendar year. b. Investigative leave can be granted in 30-day increments (for a total of 90 days) if an investigation could not be completed within the initial 10 days of administrative leave. If an investigative entity certifies that additional time still is needed to complete the investigation, an agency can further extend this period for up to 30 days at a time. No extensions are permitted after the investigation is completed. c. Notice leave cannot exceed the duration of the notice period. d. Both investigative and notice leave are subjected to greater scrutiny; they are reserved only for occasions when the employee’s continued presence in the workplace would (i) pose a threat to the employee or others, (ii) result in the destruction of evidence relevant to an investigation, (iii) result in loss of or damage to Government property or (iv) otherwise jeopardize legitimate Government interests. Additionally, agencies must first consider whether other options, such as telework or a reassignment, would be viable. e. Agencies must provide the employee with a written explanation of whether the employee was placed in investigative or notice leave and the limitations of the leave placement. f. Placement on investigative leave in excess of 70 days will constitute a personnel action under § 2302(b)(8), (9) for which the employee may seek relief before the Office of Special Counsel. 8. Permanent notations must now be made in the employee’s official personnel file (“OPF”) if he/she was subject to an adverse finding pursuant to an investigation (by an Inspector General or an adverse personnel action as a result of performance, misconduct, or for such cause as will promote the efficiency of the service), even if he/she resigned prior to resolution of such investigation. However, the employee will be afforded an opportunity to respond to the adverse finding, and he/she may appeal the agency’s decision to make the permanent notation to the Merit Systems Protection Board (“MSPB”). a. If an employee appeals the agency’s decision to the MPSB, the agency will notate in the employee’s OPF that an appeal disputing the notation is pending. b. If the agency prevails, the agency must remove the pending notation within two weeks of the MSPB’s decision. c. If the employee prevails, the agency must remove all notations of the adverse finding within two weeks of the MSPB’s decision. The new year promises many changes for all employees, whether federal or private. This firm will be carefully monitoring for forthcoming developments that may impact our clients. Stay tuned. This blog was written by Aaron Herreras and Nina Ren. NextWhat is a Suitability Determination?